Rob Kiser|Call Photo Newton High School senior Chet Jamison signs his letter of intent to play golf for Mount Vernon Nazarene University Thursday. In front with Jamison is Mounty Vernon golf coach Mike King. In back (left to right) are his brother Brock Jamison, sister Macey Markley and his parents Pam and Randall Jamison. PLEASANT HILL — It is fair to say the Jamison family changed the way the Newton High School golf program is viewed. Randall Jamison took over as coach seven years ago and his sons Brock and Chet helped take Newton to another level, qualifying for district as a team five of the last six years. Both Brock and Chet were state qualifiers and it culminated this season with Chet leading Newton to a D-III district title and berth in the state tournament, the first in the program’s history. Now Chet hopes to have the same impact on the Mount Vernon Nazarene University golf program. Jamison made it official Thursday, signing his letter of intent with his Randall, Brock, his mother Pam and sister Macey Markley all present. And Jamison said his college decision was an easy one. Mount Vernon coach Mike King is excited about getting Jamison. As golf coach, as well as his father, Randall Jamison was involved in the recruiting process closely as well. During his time at Newton, Jamison often saved his best for the biggest moments. He was a two-time All-CCC selection, leading Newton to the CCC title as a junior and earning Player of the Year honors this season. Earlier this season, Jamison carded a 31 at Cliffside for school nine-hole record. At the district tournament at Beavercreek Golf Club, Jamison shot a 3-under par 33 on the back nine for a 74 and led the team to a one-stroke victory. At the state tournament at Sunbury Golf Club, Jamison had rounds of 82 and 76 for 158. He finished 10th overall and led Newton to a sixth-place finish. Despite that, Jamison knows his golf game can still improve. Just like the Jamison family had on the Newton golf program. 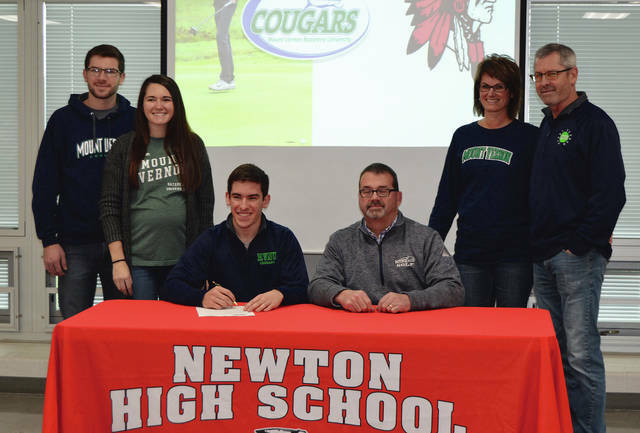 https://www.dailycall.com/wp-content/uploads/sites/30/2018/12/web1_jamison.jpgRob Kiser|Call Photo Newton High School senior Chet Jamison signs his letter of intent to play golf for Mount Vernon Nazarene University Thursday. In front with Jamison is Mounty Vernon golf coach Mike King. In back (left to right) are his brother Brock Jamison, sister Macey Markley and his parents Pam and Randall Jamison.